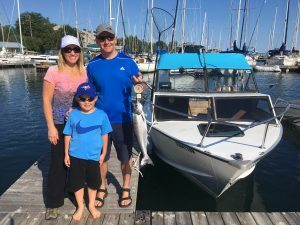 Enjoy fishing on the beautiful open waters of Georgian Bay. Just minutes from The Blue Mountains, we offer a wide variety of Fishing Charter services to make your experience right for you! REEL ‘EM IN Fishing Charters is located near the Thornbury Marina and the Beaver River. Most of all, you will enjoy the fresh air, clean water, and thrill of fishing for Salmon, Lake Trout, Rainbow Trout & Brown Trout. These fish will put up a good fight and give you some great eating!